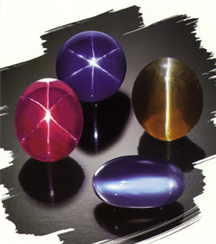 Gemstones which have an optical effect of light are Phenomenal gemstones and are characteristically cut in a cabochon shape. With Cat's Eye the Phenomenon is called chatoyancy, a luminosity producing a thin bright line. The form of a four-rayed or six-rayed star is called asterism, as in Star Sapphire. This effect is caused by the presence of a radiating pattern of needle-like inclusions.Another Phenomenon is adularescence, the silvery glow exhibited in gemstones like Moonstone. Even Cultured Pearl joins in this category with the iridescent Phenomenon called orient. Protect your Phenomenal gemstone from hard blows and scratches by caring for it as you would a fine garment. Since these gemstones include many gemstone species, ask your jeweler about the proper care for your unique Phenomenal gemstone. While today we are not limited by tradition, the symbolism of Phenomena is treasured as the birthstone for September and celebrating the fifth and forthy-fifth anniversary.